Sunday afternoon, April 1, 2012, I will performing with the Blue Ridge Orchestra at our An Overture to Spring Poster concert. The performance starts at 4 PM and is at the Diana Wortham Theater in downtown Asheville, NC. If you’re in the area, please come check out a nice program of music with a spring theme. There are three pieces on this concert. I get to play on Dvorak’s 8th Symphony and Sibelius’s Karelia Suite. There are four fine soloists, Arnold Brown on violin, Judi Lampert on flute, Pat Stone on oboe, and Casey Coppenbarger on trumpet. They will be performing on Bach’s Brandenburg Concerto No. 2. Under the direction of Milt Crotts, the Blue Ridge Orchestra is a community orchestra made up of mostly amateur players with a sprinkling of professionals in the group as well. I’ve been playing when I can with this group for several years now and also serving on the board of directors for a few. If you’re in Asheville this Sunday and looking to hear some classical music, stop on by. I cranked out another arrangement for the Lenoir Saxophone Ensemble recently. This one was on the Beatles tune, Honey Pie. Here’s a MIDI realization. You’ll have to pretend you’re hearing real musicians, but you can get an idea what I did with it. With every arrangement I’ve written for them I’ve tried to give each one it’s own unique feel or hook to set it apart from the rest. This one was easy in that respect. I left the old-timey feel from the Beatles recording in there and pretty much stuck to the same form and harmonies, just scored out for the saxophones. The members of the Lenoir Saxophone Ensemble told me they usually perform one novelty-type piece on every performance and when they listed this tune as one of the possible charts to write I figured it would fit that bill pretty well. I think it should sound pretty good on real saxophones. This is the last chart of the series they asked me to write for their upcoming project. I’ll be sure to post when they are performing any of these pieces, in case anyone is in the area and cares to hear them. I think they’ll be doing some recording sessions this summer too. They are an excellent quartet and worth hearing if you get the chance. Go to their web site and you can listen to some samples in the audio player, including my arrangement of Body and Soul. 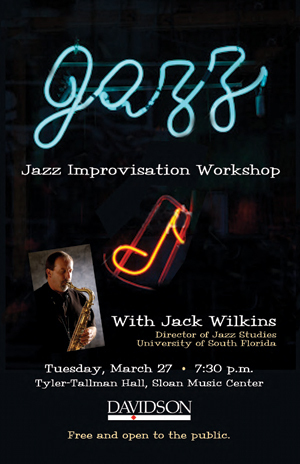 Saxophonist and Director of Jazz Studies at the University of South Florida, Jack Wilkins, will be giving a free masterclass on jazz improvisation this Tuesday, March 27, 2012, at 7:30 on the campus of Davidson College. If you’re near Davidson, NC this Tuesday night you should try to get out an check out this workshop. Thanks to Patrick Brown, who teaches jazz and saxophone at Davidson, for hipping me to this masterclass. It’s unfortunately too long a drive for me to make when I have to teach at 8 AM the next morning, but I’m sorry to miss it. Jack (no relation to me, our last names are different, even though my name sometimes gets misspelled like his) is a great player and I’m sure he’ll have some great stuff to talk about. Keep your eyes posted in case he plays nearby while he’s traveling through. Duke Ellington was one of the most significant musicians in jazz. His influence is particularly far reaching because he was not only an important pianist, but also a highly creative and original composer and also led one of the longest-lived and most stable big bands in jazz history. This podcast discusses Ellington’s music, personality, and also that of some of the more important sidemen who performed with Ellington throughout his career. You can download this episode by clicking here, viewing it on my Podcasts page, or by subscribing through iTunes. I just finished another saxophone quartet arrangement for the Lenoir Saxophone Ensemble, one of a series of charts I’ve been writing for them. This particular one is on a tune by Leslie Bricusse and Anthony Newley, written for the movie Willy Wonka and the Chocolate Factory. Here’s a MIDI realization of my arrangement. For all these sax quartet arrangements I’ve tried to explore something a little different to give each one something unique to set it off from the rest (beyond just a different tune). In this chart I experimented with changing meters around and an unusual metric modulation between the different feels. It starts off with a rubato introduction based on the bridge and then a faster swing feeling. The metric modulation between the faster passages (usually in 5/4) and the slower (4/4) passages is 3:2. The quarter notes of the faster 5/4 is equal to the quarter note triples of the slower 4/4 measures. It reads a little trickier than it sounds, I think. At times I even explicitly incorporate the quarter note triplet to become the quarter note as the tempo changes in order to make the transitions a little more obvious. If you aren’t familiar with this tune already, here it is from the movie. My treatment of this tune is quite a bit different. Moments of insight are a very-well studied psychological phenomenon with two defining features. The answer comes out of the blue – when we least expect it. … [And] as soon as the answer arrives we know this is the answer we’ve been looking for. … The answer comes attached with a feeling of certainty, it feels like a revelation. These are the two defining features of a moment of insight, and they do seem to play a big role in creativity. I’ve found that when composing music the correct idea I’ve been looking for often appears suddenly, sometimes after a long period of struggling with finding the perfect phrase. And when it does come it also frequently feels correct. I just know that this phrase is exactly what I was looking for. While some people may feel the compositions and arrangements by Sammy Nestico are dated, I have always loved his music and count Nestico as being one of my biggest influences. In the summer of 1993 the now defunct International Association of Jazz Educators published an interview of Nestico by percussionist and composer Dave Black. Black has made his interview available here. Do you have a special approach to your writing which has made your compositions so successful? It’s hard to answer that question. I’ve always felt that there are three elements in music – melody, harmony, and rhythm – and I try to make my music as melodic as possible. I love Tchaikovsky! When you go to the Hollywood Bowl to hear Tchaikovsky, it takes two nights to play all his music because people love to hear melodies. I always think about an audience listening to my music, so I’m very conscious about melody first, harmony second, and rhythm last. That’s the rule I try to follow, and it seems to please the people who like my music. Today’s contemporary music, however, very successfully reverses these elements – rhythm has become the most important element, melody is second in importance and harmony is third. Thanks to Jim Martin for passing this along to me. Jim is a fantastic composer and arranger. I have a few of his charts in the Asheville Jazz Orchestra book that we play a lot. The 1930s and 1940s was jazz’s most popular style period. Moving away from the collective improvisation of early jazz styles, the Swing Era marked the development of the big band and focused more on the arrangements rather than improvisation. There were still many notable soloists the developed in the Swing Era and these musicians left important influences on jazz. This podcast discusses some of the stylistic traits of Swing Era jazz and covers some of the most influential artists and bands from this period. As with my other podcasts, you can download this episode by clicking here, viewing it on my Podcasts page, or by subscribing through iTunes. The other day I had a great phone conversation with David Shulman. Shulman is a physical therapist who specializes working with musicians who have repetitive motion injuries related to playing. He had contacted me to ask for some ideas working with brass players who have injured lip muscles. We talked for a while about some of the things brass musicians can do away from the instrument to help build (or rebuild) muscles around the lips without actually playing, which can lead to re-injuring a damaged muscle. I talked to him a little bit about free buzzing, the pencil trick, and the P.E.T.E. Here’s a short video he has put together where he describes his practice and the workshops he presents to music students and teachers. One of the things I asked David about was about which lip was more prone to being injured. Donald Reinhardt felt the upper lip was more likely to be injured due to excessive mouthpiece pressure. David also noticed that the majority of lip injuries happen on the upper lip. Reinhardt’s advice to keep more mouthpiece “weight” on the lower lip should help brass players avoid injuries like this.